Getting hit in the head is a fact of life for athletes in fast-paced, competitive sports. But checking those athletes for concussions takes time away from the action. So some people in the sports industry have suggested using impact measurement devices, such as chips planted in helmets or worn on a patch behind the ear, to give health care professionals a heads up that someone could be injured. Halley Sayre ’17 holds up an X-Patch made by X2 Biosystems, which University of Lynchburg students use to study head impacts. 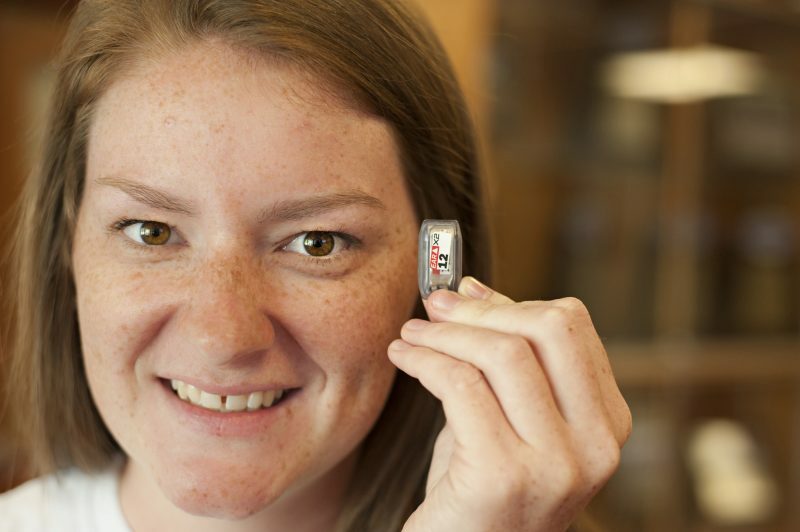 But research by recent University of Lynchburg graduate Hallie Sayre ’17 casts doubt on that idea. By urging caution, she hopes to prevent athletes from suffering undetected concussions. Hallie will present her research on concussions in women’s soccer and lacrosse at the National Athletic Trainers’ Association national conference the week of June 26. She also will pick up the NATA Student Writing Award for Original Research, which recognizes her outstanding research and report. When it was time for college, she knew she wanted to attend a Division III school with an athletic training program, and Lynchburg was one of the first schools to pop up in her list. At the end of Hallie’s junior, Dr. Tom Bowman offered to mentor her on an independent research project. Every year, he selects standout students to dig through data on head impacts and test theories about concussions. 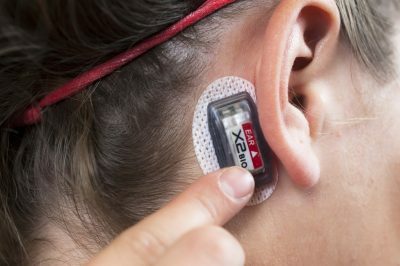 For several years, several soccer and lacrosse student-athletes at Lynchburg have worn an X2 Patch, which measures how hard they are getting hit in the head. Dr. Bowman’s students combine that data with video recordings of games for their research. A chip worn behind the ear of a student-athlete records the severity of head impacts. Hallie studied four student-athletes who received concussions. She reviewed game footage and the X2 Patch data to determine the severity of the hits that could have caused the injuries. In every case, the force of the impact fell below the thresholds that have been recommended for indicating a concussion. That means that these athletes’ injuries would have gone untreated if athletic trainers had relied only on head impact data during a game. “As health care providers we have to make sure that we’re looking at all types of things, not just the head impacts from the sensor but also doing an exam and putting all those elements together to diagnose a concussion,” Hallie said. Hallie’s research asks important questions and helps fill a significant void, because most research on the topic only examined men playing football or hockey, Dr. Bowman said. Hallie’s conclusions should remind practitioners to be cautious about relying on helmet sensors to dictate when they should check for a concussion. Dr. Bowman was proud of the way Hallie stuck with her topic, crunching numbers and revising her paper several times to convey the findings effectively. Hallie said it was challenging to complete the research, but her faculty advisors helped her keep up her determination to finish. Later this year, Hallie will head off to Greenville, North Carolina, to earn a master’s degree in physical education at East Carolina University.